From left are Sejoon Kim in the School of Energy and Chemical Engineering and Professor Bradley Tatar in the Division of General Studies at UNIST. Their findings have been published in the April issue of Coastal Management. Dolphin liberation in South Korea has raised awareness towards the welfare of marine animals and has resulted in the strengthening of animal protection policies and the level of welfare. An engineering student, affiliated with UNIST has recently carried out a scientific investigation on dolphin liberation in South Korea. The paper presents the overall analysis of the social impact of the first case of dolphin rehabilitation in Asia, which occurred in 2013. This study has been carried out by Sejoon Kim in the School of Energy and Chemical Engineering in collaboration wit Professor Bradley Tatar in the Division of General Studies at UNIST. Their findings have been published in the April issue of the journal, Coastal Management and will be published online, this month. From left are Professor Bradley Tatar in the Division of General Studies, and Sejoon Kim in the School of Energy and Chemical Engineering at UNIST. The research team hopes to expand their research to areas beyond the study of dolphin liberation and carry out in-depth case studies on various topics, including the whale-eating culture in Ulsan, the public perspective of dolphin shows, as well as the establishment of new types of dolphin life experience facilities. 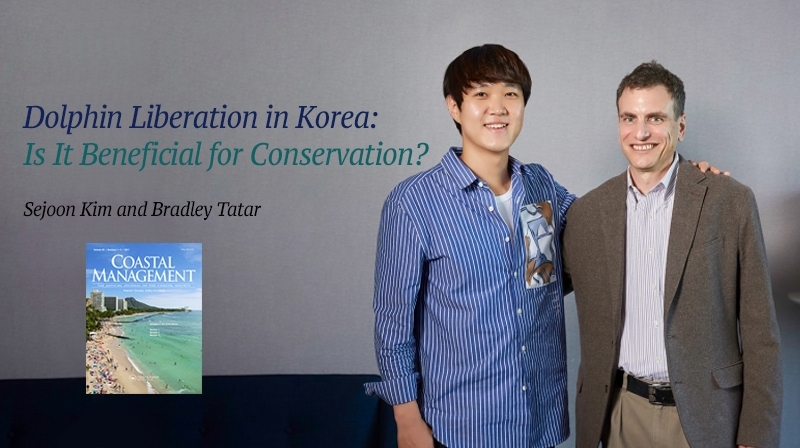 Sejoon Kim and Bradly Tatar, “Dolphin Liberation in Korea: Is it Beneficial for conservation?”, Coastal Management, (2018). UNIST to Host 2nd ‘Fourth Industrial Rev..
UNIST Student Honored for the 2018 ISSCC SRP P..
[Short News] UNIST Caught the Eyes of Internat..